You like to fish? Then you will love the Mammoth Lakes fishing derbies scheduled for this year. Convict Lake hosts the following derbies and they are the best things happening if you like to put your pole in the water and possibly win a prize for the big fish. If you can't tell by now, fishing around here is a big deal. We take great pride that we grow our own Alpers Trout and we stock the lakes with plump large trout so you can have lots of fun. The Department of Fish and Game also stock the lakes so you always have something to catch when you're here. Thank goodness the state of California believes in our economy and tourism! This is the current upcoming calendar of events. Fish caught 14 Inches or longer are eligible to be registered. Prizes: Up to sixty (60) prizes will be distributed for Round-up at the Lake. Drawing: Each person with a registered fish will be entered into the prize drawing for derby entered. Names and prizes will be drawn at random until all prizes are awarded. Prize winners will be posted at within 30 days of the last day of the derby. Hangman's Bonus Derby Weekend is part of Round-up at the Lake. Our Fishing Lodging Special will be offered on this weekend, dining and boat rental packages starting at $359+tax. 12 Tagged Alpers Trout will be stocked for bonus derby weekend. Cash prizes: $2,000 in cash prizes for each bonus derby will be associated with the tagged fish and distributed as follows: one (1) $1,000, one (1) $500 and ten (10) $50. If you catch a tagged fish, you will receive payment in the amount of the associated tag number. Check-in: Fish must be checked in at the general store by closing on the day of your catch. Check for closing time on the day you are fishing. Tag must be intact with the fish at time of check-in or FISH WILL BE DISQUALIFIED. $2,000 in Gear & Resort Prizes! Competition Times: Saturday, June 18, 2011 sunrise to sunset; Sunday June 19, 2011 Sunrise to 2:00pm. BBQ on Saturday, June 18 and Jar of YUM TroutKrilla bait included with entry. 12 Tagged Alpers Trout will be stocked for the Father’s Day Derby. Prizes: Four (4) Okuma Safina Rod & Reel combos with Tackle Bag, two (2) Okuma Safina Rod & Reel combos, two (2) $100 Resort Gift Certificates, two (2 )$50 Resort Gift Certificates, two (2) $25 Resort Gift Certificates. If you catch a tagged fish, you will receive the prize associated with the tag number. Three of the largest fish caught on YUM TroutKrilla bait will receive one of the following three prizes, one (1) Okuma SST Rod/Reel Combo with an Okuma Tackle Bag, one (1) pair of Costa Del Mar sunglasses or one (1) pair of Costa Del Mar sunglasses. Awards: Largest fish prizes and all prizes associated with tagged fish that were not caught will be awarded through a drawing at 2:30pm on Sunday, June 19, 2011. You must be present to win. Competition Times: Sunrise to Sunset. 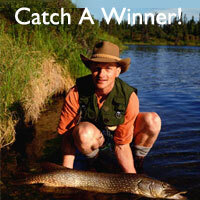 Each entrant may register one fish per derby entered that is 14 inches or longer into the prize drawing. Check-in: Check fish by store closing time on the day of the catch. Please check store closing time for the day. Competition Times: Sunrise to Sunset on each day of the competition dates. Morrison's Bonus Derby Weekend is part of Ambush at the Lake. Our Fishing Lodging Special will be offered on this weekend, dining and boat rental packages starting at $359+tax. As you can see, Fishing in Mammoth is a big deal. We do our best to keep every angler happy. If you're interested in attending during one of the fishing events, give us a call to for help getting really nice cabins. Many available are close to the lakes and offer special amenities such for fisherman such as boat parking. We'll see ya on the dock!